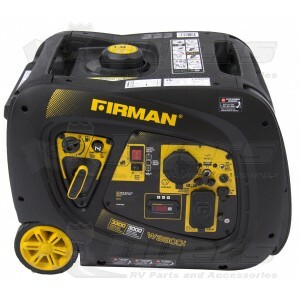 The FIRMAN W03083 Inverter generator features 3300 starting watts and 3000 running watts. Power is supplied by our Max Pro Series 171cc FIRMAN engine which runs cool and efficient thanks to its Phoenix Fat Head Block. Our Whisper Series muffler keeps the W03083 running a quiet 58 decibels – well below the standards set by the National Parks Service, and our spark arrester has been approved by the USDA Forest Service. The 1.8-gallon fuel capacity provides a whopping 9 hours of run time. Starting is as simple as the push of a button on the remote start key fob from up to 168 feet away. The FIRMAN Volt Lock automatic voltage regulator ensures clean, consistent power output from the FIRMAN Power Stream alternator. For the ultimate in portability the W03083 is less than 96.8 lbs. with a built Tuff-Stuff handle and wheel kit. Major touch points are all front and center for easy starting and use, power, choke, eco-mode and all receptacles are conveniently located for easy access. The durable, lightweight, powerful inverter is built for years of use. Just add gas! Everything you need comes standard in the box including: oil, funnel, owner’s manual and, spark plug wrench. - Fuel Economy Mode – reduces fuel consumption and promotes engine efficiency. - The FIRMAN 0HV engine (Max-Pro Series) for longer life/higher performance/lower maintenance. - Cast iron sleeved engine for long durability with automatic low oil shutdown protection. - Largest tank in the industry with extended run-time (less re-fueling) with integrated fuel gauge for convenience. - Quiet muffler (Whisper Series) with USDA FS certified spark arrester. - Conveniently located multi-featured control panel with FIRMAN custom designed outlet cover protecting outlets from dirt, dust and debris. - 3 in 1 Data-Minder monitors running hours, voltage and frequency. Shipping Dimensions: 26.6" x 18.5" x 19.7"